Neighbors and drivers fear a traffic disaster because Seattle lacks money to replace the Magnolia Bridge, expected to wear out in the 2020s. 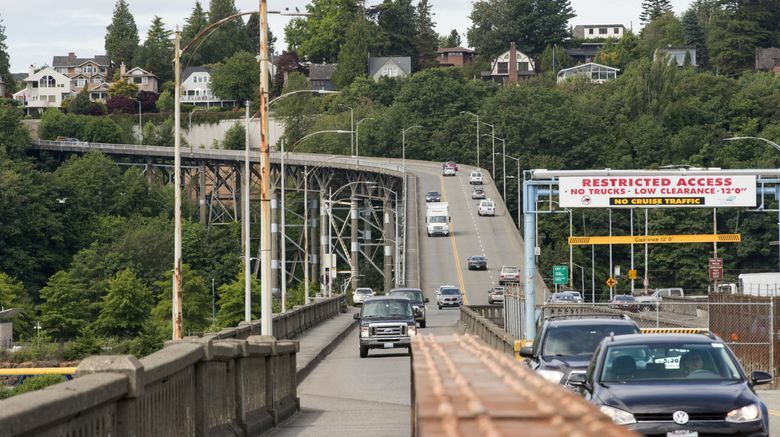 The Seattle Department of Transportation has stirred outrage in Magnolia by announcing the city lacks a plan or money to replace the neighborhood’s crumbling, 89-year-old Garfield Street bridge. The concrete structure was weakened by the Nisqually earthquake in 2001. A four-year study afterward considered 25 options, before SDOT and the community agreed in 2006 that a full rebuild is best. City leaders procrastinated. Neither of the city’s past two property-tax levies provided money for reconstruction, nor has a serious budget proposal emerged. The Seattle Department of Transporation will display road options and chat with residents about the Magnolia Bridge Planning Study. June 14 and 20: 5-7 p.m., Magnolia Park parking lot, 461 Magnolia Blvd. 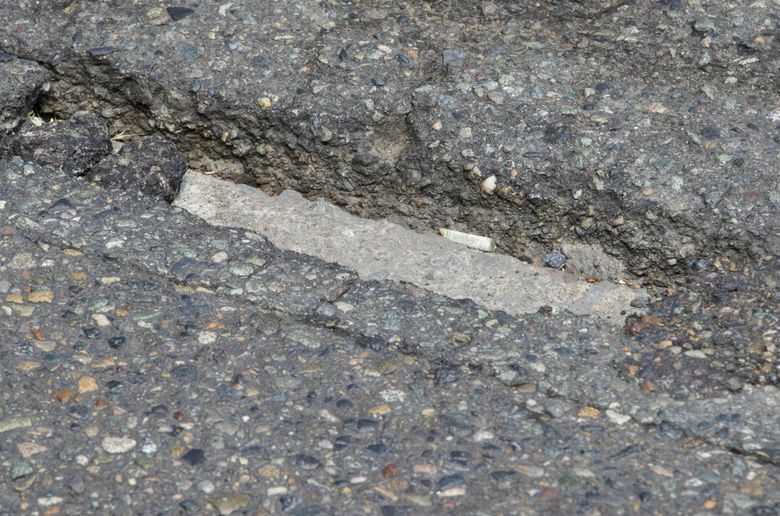 W.
But SDOT staff launched new studies this spring, and revealed that a new bridge would cost $350 million to $400 million, up from $262 million a decade ago. Now, consultants are drawing combinations of smaller spans and street improvements, in hopes of finding a more affordable alternative. “We never had the money. It was unachievable to find a full funding program” for a replacement, Kit Loo, a city bridge engineer, told 400 residents who packed a church meeting hall last month. During the question period, neighbor Rick Ellis shouted that the city was reneging on a longtime commitment. “From my perspective, I guess I just thought this was moving along, and we lost touch with what the steps were,” Ellis said afterward. In fact, as recently as 2015 the city, state, and federal agencies signed a 333-page environmental report that proposed and justified a new bridge. Many residents wonder if Seattle is shortchanging drivers as part of a philosophy this decade to favor transit and bicycle routes in an increasingly crowded city. But SDOT insists the Magnolia study isn’t aiming to coax people out of their cars. “The whole point of coming up with an alternative is to retain the same level of access to the community in-and-out, whether on a car or a bus, or walking, or biking,” said SDOT spokeswoman Mafara Hobson. Jeanne Kohl-Welles, a Metropolitan King County Council member representing the area, said losing the Garfield crossing — the southernmost of three vehicle paths onto the peninsula — would cause spillover traffic jams into Ballard, the Salmon Bay industrial area and Fishermen’s Terminal. Why has the issue erupted now? SDOT is keeping a promise made in the 2015 Move Seattle levy, which allocated $1 million for a study, Hobson said. Drivers in the upscale neighborhood northwest of downtown are already bracing for more congestion. The nearby Alaskan Way Viaduct and its Belltown ramps permanently close this fall, and will be demolished. Traffic will thicken next year when Expedia moves its headquarters to the waterfront north of Centennial Park. Sound Transit 3 light rail isn’t due from downtown to Ballard until 2035, and during construction, a lane or two of 15th Avenue West may close. Loo said the old bridge remains safe to drive — unless an earthquake strikes — and he expects it to last until 2024 at least. Weight limits might be required sooner, he said. 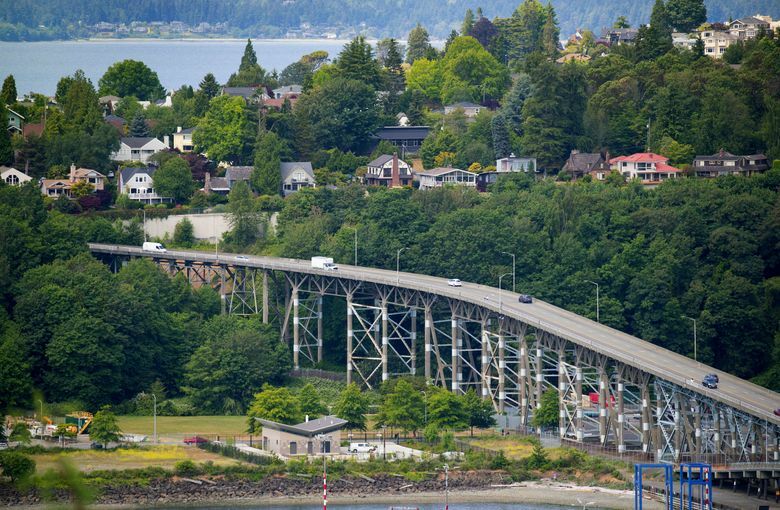 The bridge carries 17,000 vehicles a day over train tracks and a ravine — not only serving Magnolia residents but also people traveling to the Pier 91 cruise-ship terminal and the Elliott Bay Marina. 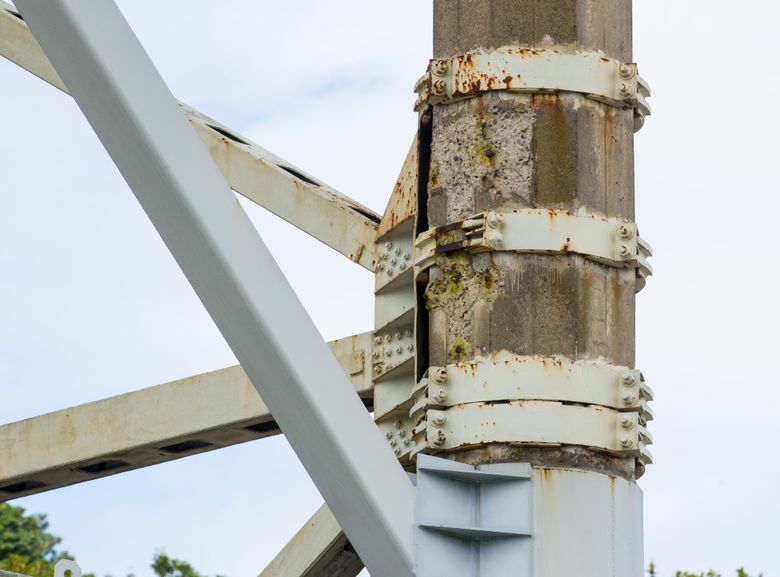 The bridge is deemed “structurally deficient” in the National Bridge Inventory, and it’s been braced or reinforced many times. Routine inspections in March found deck cracks as long as 20 feet. Concrete is flaking off where the bridge rests on support columns. To be sure, other needs await money citywide. 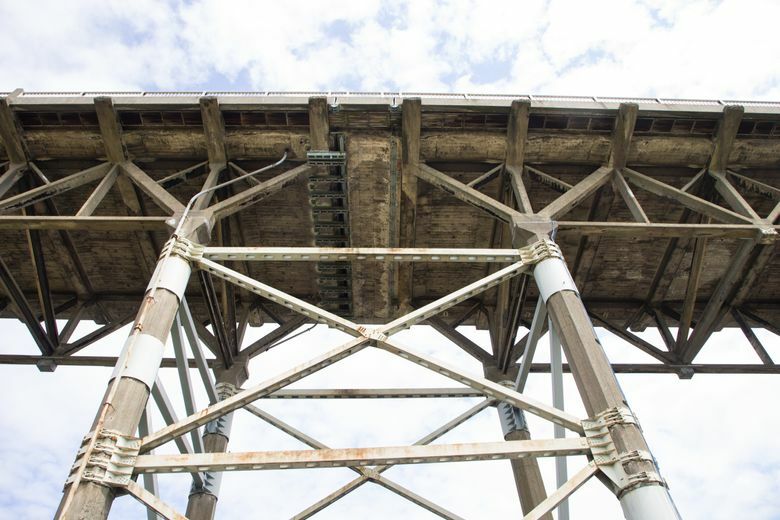 The 101-year-old Ballard Bridge serves four times the trips, sometimes sticks open and lacks safe walkways. Seattle is falling behind on promises to deliver RapidRide bus upgrades, 50 miles of safe bicycle lanes and sidewalk curb ramps. Traffic could be shifted to a widened West Dravus Street overpass, a 1.3-mile detour from south Magnolia. That notion set last month’s forum crowd abuzz. “Dravus is horrible!” a woman yelled. SDOT is also considering an elevated viaduct from West Armory Way over the BNSF Railway freight yard, landing on Magnolia’s east slope. Or the city and Port of Seattle might build a short bridge from Interbay directly to Pier 91, industrial flatlands and Elliott Bay Marina. 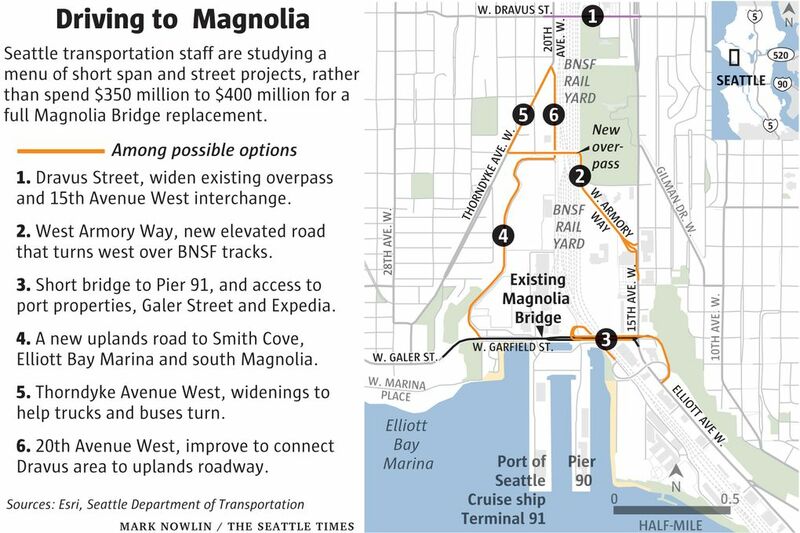 Truck deliveries of food or supplies to the Magnolia Village retail area, in the south part of the peninsula, would become circuitous under SDOT’s options, said Jason Thibeaux, executive director of the Magnolia Chamber of Commerce. “None of them address getting traffic into the heart of Magnolia,” he said. Magnolia resident Janyce Fink suggested that citizens urge the port to donate to a bridge-replacement fund. “The port does have a very big dog in this fight, because they are ever-expanding the cruise-ship business,” she said. The port says it’s too early to take a position. A short bridge to Pier 91 might qualify for federal FAST Act grants, created by U.S. Sen. Maria Cantwell, D-Wash., for freight and port facilities. The act supplied $45 million to the Lander Street Overpass in Sodo, where construction just started. Retired City Councilmember Nick Licata recalls his colleagues winced years ago when they learned that the ratio of high cost to relatively low traffic disqualified Magnolia Bridge from federal highway grants. “It never got quite the boost from the executive [mayors], and the council never picked it up,” Licata said. State Sen. Reuven Carlyle, D-Seattle, said frustrations in Magnolia reflect broader anxiety over rising property taxes and a lack of confidence about how public dollars are spent. People at the forum vented about other issues, such as the $275 employer head tax for homeless services, multimillion-dollar bike lanes and thin police staffing. Carlyle says SDOT bungled its rollout by dismissing a new bridge prematurely, before it knows the price of multiple short projects — which might not necessarily be cheaper. More importantly, the bridge’s benefits are being overlooked, he said. Cost estimates for the bridge alternatives will be published by SDOT within a few weeks.